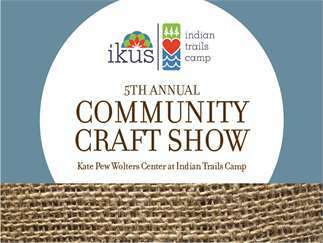 Join IKUS Life Enrichment Services on Saturday, April 6 for our 5th Annual Community Craft Show! This event will be held at the Kate Pew Wolters Center at Indian Trails Camp from 10am to 12pm. We'll have a number of artists and vendors at the event with some great homemade and handcrafted items available for sale. There is no cost for admission. This is a family-friendly event that is open to the community. Snacks will also be available for purchase. Please join us for this fun annual event!! VENDORS: Artists and vendors of all abilities with unique handmade and homemade goods are encouraged to participate. There is a $20 refundable vendor fee (refunded on day of event) and we do ask vendors to promote the event. For more information or to request a vendor registration form, email info@ikuslife.org. Cost: No cost for admission.